Students work independently, with guidance from the instructor to complete and present a research project. In addition, students grow plants, landscape, and visit various sites to work on additional agricultural projects in the community. 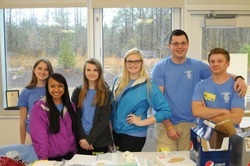 In this photo, students successfully presented information about hunger to Rolesville Middle School students. The students researched the information and created an innovative presentation for the students. They all did a great job and this was their final exam grade. Each of them made a unique product to accompany their research and wrote a research paper, as well.